*The 2010 year for my weekly syndicated column, The Pulse of Entertainment (total readers – 1/4 million a week), was sort of a world-wind experience because of the addition of my Twitter and Facebook social networking pages (www.twitter.com/eunicemoseley and www.facebook.com/thepulseofentertainment) – that opened up my column to a new audience that currently receives its news from their cell-phone applications. It also gave me a complete year of its website, www.ThePulseofEntertainment.com, being in full operation. The Pulse of Entertainment website offers the hottest news, interviews and entertainment, and has an online broadcasting network with a line-up of music videos and interviews that run 24/7 to a worldwide audience. Just in its year of operation the online broadcasting network page, “alone,” is attracting 3,000 viewers a month. The website’s content is “shared” by an average of 400 people a week, and it currently receives – on average – 2,000 hits a week. In the 2010 year I interviewed many Jazz greats such as my old friends Kirk Whalum and Boney James, the most prolific saxophonists I’ve had the pleasure of talking to. As well as interviewing new comer’s Jackie Joyner, Michael J. Thomas, Tia Fuller, and Eric Darius. I also had the pleasure of interviewing actress Alfre Woodard (I am such a big fan) at the ACLU Bill of Rights Awards where she presented Clint Eastwood’s The Sundance Institute with an honor. 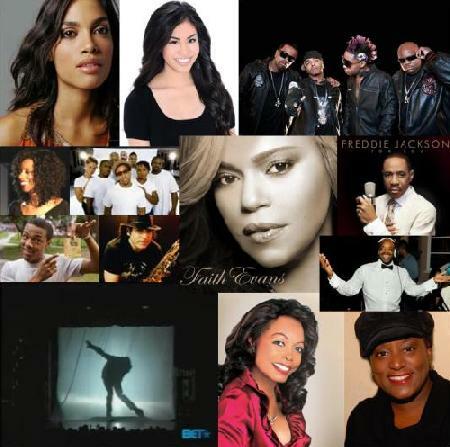 I attended the 2010 BET Awards and BET Celebration of Gospel where I was able to talk to some of my favorite artists. I noticed that the media – as a whole – is sleeping on the Celebration of Gospel because I didn’t have elbows and body parts pushing me out the way for a photo shot or a for chance to get an interview. I also covered the ASCAP events (R&S Awards, Women Behind the Music); the Screen Actors Guild (SAG) Awards nominee announcements; the NAACP Image Awards and its luncheon where I saw the outstanding performance of Michael Jackson protégé Judith Hill. I was also able to get up personal with some of my favorite actors/actresses there, such as Ashley Argota of Nickelodeon’s “True Jackson, VP,” who agreed (as did the star of the series, KeKe Palmer, at one point in her career) to be a judge at my national “Uplifting Minds II” entertainment conference’s talent competition showcase (www.UpliftingMinds2.com). At the Gracie Awards I had the pleasure of interviewing some of the top women media personalities in the country. One media personality, HLN’s Robin Meade, after “interviewing me” said she was very impressed with my own media achievements and that I should be receiving an honor too – that was a sweet compliment. I also had the pleasure of interviewing Tatyana Ali (“The Fresh Prince of Bel-Air”) who was promoting a new show, created by Bentley Kyle Evans, “Love That Girl” which currently airs on TV One. I also talked to K-Ci and JoJo about their reality show on TV One, “K-Ci & JoJo Come Clean,” and Dru Hill about their reality show appearance on BET’s CENTRIC Network in ‘Keith Sweat’s Platinum House” – both series are on repeat. Other events I attended for review included ASCAP sponsored Jermaine Dupri/Ocean 7 Pre-VMA Party; the performance of Sunshine Anderson at Club Aurora in LA; Mo’Nique during her comedy tour; the play ‘Let Freedom Ring;” the Vernon Neilly Band; R&B sensation Trueful’s CD Release Concert with Dru Hill and H-Town; K-Ci and JoJo with special guest Dru Hill concert at Nokia LA Live, and the Los Angeles premiere of “Dreamgirls,” where I felt privilege to witness the original Dreamgirls back together again in attendance – Sheryl Lee Ralph, Jennifer Holliday and Loretta Devine. I also reviewed the CD releases of such powerful singers as Leela James (“My Soul”), Dru Hill (“InDRUpendence Day”), PJ Morton (“Walk Alone”), Jon Secada (“Classics”), the cast of “Fela,” and Freddie Jackson (“For You”). As well as review the CDs of the talented Tye Tribbett, Joe Pace, Evelyn Turrentine-Agee, JJ Hairston & Youthful Praise, Incognito, and Bishop Leonard & Bryant Scott. Other artists/actors/actresses/comedians interviewed in 2010 by The Pulse of Entertainment included Denee Busby (HBO’s “Eastbound and Down”); comedian/actress Luenell (Borat); Anne McKnight (Martin Lawrence’s 1st Amendment); Royce Reed (VH1’s “Basketball Wives”); Gbenga Akinnagbe (CBS’ “The Good Wife,” The Lottery Ticket); Lester Speight (Faster, Transformer III); Gary Anthony Williams (“Boondocks”); Floacist, Teairra Mari (The Lottery Ticket); Arrested Development, Julie Pace Mitchell (“Young and the Restless”); Aldis Hodge (TNT’s “Leverage”); Soweto Gospel Choir, Page Kennedy (Spike TV’s “Blue Mountain State”), and KeKe Wyatt. I felt very blessed to be asked to interview, one on one, such high-profile people as Nick Cannon (about his network TeenNick), Faith Evans (about CD release), Will Downing (“Love, Lust, Lies”), Raven Symone’ (“Tinker Bell” DVD), KeKe Palmer (“True Jackson, VP,” Akeelah and the Bee), Angela Dean (designer to the stars like Oprah and Queen LaTifah), Shad “Bow Wow” Moss (about The Lottery Ticket), Florence LaRue (5th Dimension anniversary) and Clifton Powell (GMC’s ”Love Me or Leave Me”). I couldn’t have asked for a more in 2010 than what was given. Hopefully 2011 will be just as exciting for The Pulse of Entertainment. For more information on my weekly column log onto its website www.ThePulseofEntertainment.com, for more on me – Eunice Moseley – log onto www.FreelanceAssociatesInc.com and to see some video-taped interviews and event coverage log onto www.youtube.com/FreelanceAssociates.